Review Summary: Arshad Warsi and Rajpal Yadav are two crooks on a treasure hunt which leads them to a palatial house with two pretty maidens. So what's the real treasure: gold or gals? It’s ironic how the title resonates with the film. 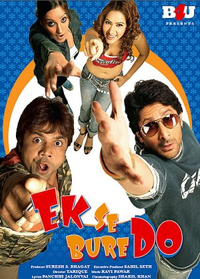 Arshad Warsi and Rajpal Yadav are two crooks on a treasure hunt which leads them to a palatial house with two pretty maidens. So what's the real treasure: gold or gals? Time and again one comes across a statement that 'this film has been made for single screen audiences in smaller towns and cities'. Well no audience should be subjected to a movie like this. On the whole EK SE BURE DO has no chances whatsoever!